It's Monday--Picture Books Past. 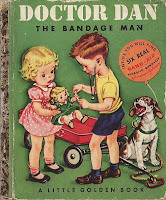 Most American children born since World War II have grown up with books published by Golden Books (now part of Random House.) Many fine writers and illustrators produced the best of these inexpensive books. Read the brief "Story of Little Golden Books" here. Consider getting Golden Legacy, an entertaining book by Leonard Marcus which tells the history of the company and much about the publishing business of the mid-century period. Take a look at the book here.